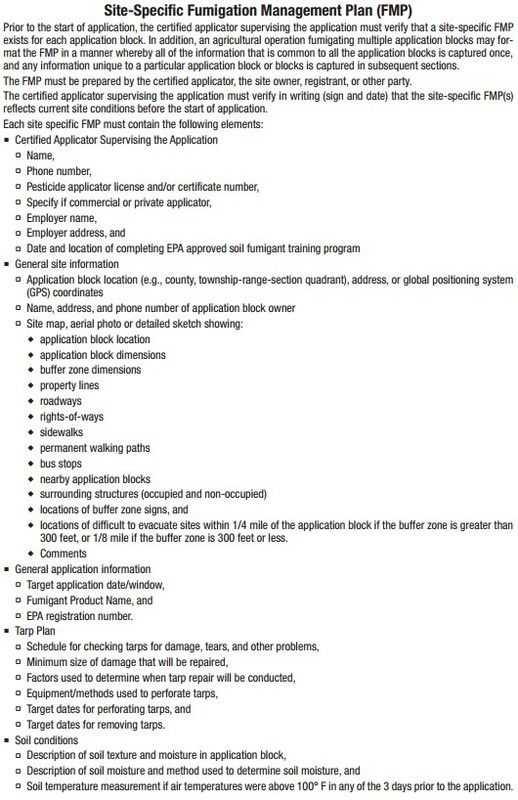 The (Material) Safety Data Sheet, or (M)SDS, is a regulatory document. SOLUTIONS? SOLUTIONS? SOLUTIONS? SOLUTIONS? SOLUTIONS? What are Strawberry Farmers Biggest Problem?....Nematodes, Weed Seeds and Fungi? Georgia Organic Solutions - http://healthy-crops.com, OMRI - GOS Neem 7-Way is EPA-registered to treat dozens of insect pests, including the ones that take the biggest bite out of your pocket. From nematodes to thrips and from aphids to spider mites, GOS Neem 7-Way is the safe solution that works! Organic strawberries finally paying off for Wish Farms - NO Pesticide Use? Wish Farms Video: ClearChoice_Fields ORGANIC! Wish Farms Video: ClearChoice_Strawberry_Green_House ORGANIC! Dozens of citizens who live near local strawberry farms met at Turkey Creek Middle School Sept. 22, to discuss concerns about the fumigant Paladin with staff from the Hillsborough County EPC, Florida Department of Agriculture and Florida Department of Health. 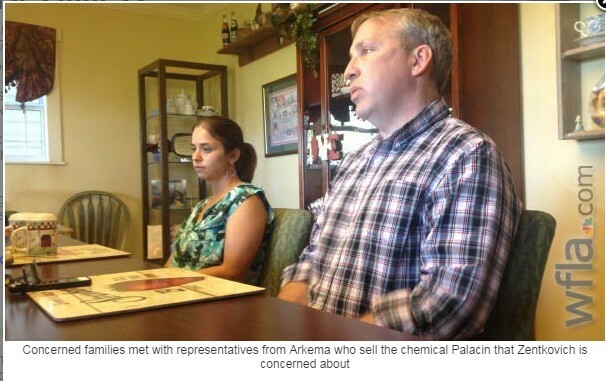 Although local agriculturalists and employees of Arkema, the company that manufactures Paladin, maintain the chemical’s unpleasant odor had been controlled this year through the use of thicker tarps, the citizens who spoke at the meeting disagreed. But, the most common concern among attendees was not the smell, but rather, that the use of Paladin was linked to health problems, they said. Shortly after Paladin was applied for the first time last year and again this year, many at the meeting said they were treated for respiratory issues they had never suffered from before. Along with his family, Mac Garner, a Dover resident, listed neighbors and friends who had cited problems with Paladin. Soon after they smelled the odor, Garner’s son began to exhibit respiratory problems that matched the symptoms of exposure described on Paladin’s label. Garner said Arkema representatives suggested he move his family to a hotel until the odor was gone, but he chose to stay in his home. His son moved temporarily to a relative’s house. Garner asked the owner of the farm near his home to use a different fumigation agent, but the farm owner said he could not change his method. Garner and Mary Zentkovich organized the public meeting and got the word out by going door-to-door, asking neighbors whether they had suffered from health problems that could be Paladin-related. Their efforts brought dozens of concerned citizens to the meeting. Zentkovich said her family has experienced a variety of symptoms, including swollen lymph nodes, vomiting, nosebleeds and headaches. These were treated with IV treatments, antibiotics and other medications. Last year and this year, because of Zentkovich’s family’s symptoms, Arkema paid for their relocation after Paladin was applied. Some attendees believed Paladin had caused health problems for their animals, as well — even death. One woman said shortly after Paladin was applied near her home, three of her six cats died. Another woman who raised birds for the pet trade said within two days of Paladin’s application, the birds she had kept on her porch had died. Yvonne Painton hired attorney Frank Charles Miranda to conduct an investigation and file a lawsuit against Arkema. Miranda said he had formed a legal team comprising his firm, a firm in Louisiana and a third in Connecticut. His firm regularly takes cases in which people have been harmed by large corporations in some way. A team of employees from Hillsborough County’s office of the Florida Department of Health spoke with Plant City citizens about their concerns at the meeting. Michael Wiese, an epidemiologist for the DOH, said it was difficult to determine whether the concerned citizens’ health symptoms were directly linked to Paladin. The fumigant is applied in August and September, which coincides with students’ return to school — a common cause of communicable respiratory illnesses — as well as the beginning of flu season. Wiese said the department did not keep a record at the local level of how many people had called with Paladin-related concerns. He said “only a handful of people” had come to him with complaints that they had smelled the chemical and then felt sick. Wiese said the department was willing and available to hear people’s concerns, whether they would like to speak with an epidemiologist, toxicologist or other professional. The office can be reached at (813) 307-8000, or DLCHD29WebsiteDistribution@flhealth.gov. After two years of illness, Mary Zentkovich wants answers about what is making her family sick. “Having a burning in your chest, coughing, and having headaches that you want to hold your head and put ice on it, that's not normal,” said Zentkovich. Zentkovich thinks the fumigant Paladin being used in nearby strawberry fields is the reason for her family's and other neighbor's illnesses. PLANT CITY, FL (WFLA) -Yvonne Painton knew she was sick but told News Channel Eight that she never knew the cause until she discovered several of her neighbors were also sick. “I've been under a pulmonologist care for over a year, before that my allergist and they're all scratching their heads,” said Painton. Painton was one of more than 50 people who showed up for a meeting at Turkey Creek Middle School in Plant City. The group of people, many who live in Dover and Plant City, live near strawberry fields were the fumigant Paladin was applied. Many of the residents believe Paladin is to blame for their illnesses. “I have severe respiratory illness. I am prednisone now for 21 months,” said Painton. Dover, FL -After two years of illness, Mary Zentkovich wants answers about what is making her family sick. With the continuing rumbling about putting a new baseball arena somewhere near downtown Tampa, there is the accompanying sniping about whether we would support a team over here any better than we’ve done on the edges of downtown St. Petersburg. Don’t know the answer to that one; my best guess is a few thousand more seats a game better, but that’s about it. But then, just when you wonder if it’s worth it, you watch the Rays of the past two weeks and especially that last moment of their Thursday night win over the Yankees. The Yankees, thanks largely to the local presence of George Steinbrenner and his family, contributed so much to so many in our town, and they still do. At the same time, the Rays are demonstrating their own brand of community involvement on both sides of the bay. Watching both organizations put on a display of the magic of baseball Thursday was a reminder that what they bring to our area goes beyond economics. Meanwhile, from Plant City comes this: “Mr. Otto, I know you referenced in your column that it was going to smell bad around Tampa for years to come because of the fact that strawberry growers were going to be using more Paladin in the future. The media made a big deal on all channels of TV and in the paper. “We certainly were convicted in one day of being the culprit for this odor in downtown Tampa. It certainly caused our neighbors to call state officials and complain about something that they did not smell before this media event. It certainly caused problems for growers because people were convinced that we are doing something that is harmful and should not be allowed to do it. “The public thinks that if our fumigant moves all the way to Tampa then certainly we are harming them and we should not be allowed to use it. “I write this because at last week’s EPC meeting the person in charge of air quality said that everyone was mistaken and in fact the odor was caused by a fire at an asphalt plant in Ybor City. This is public record, I have not seen or heard any mention in the media about this fact. “This certainly has biased the public’s opinion of strawberry farmers. I am a grower who has been in the business for 34 years and have never experienced the scrutiny that I received after this erroneous story was reported as fact by every official questioned by the media. Someone needs to set the record straight.” — Ronnie Young, Dover. Finally there was a letter from Joseph Abad, who says he is also known as “Submarine Jr.” It seems as if everyone in Ybor and West Tampa used to have their own monikers. The Submariner got me. Anybody out there know Fast Eddy and why he was so quick? PROBLEMS? - PROBLEMS? - PROBLEMS? - PROBLEMS? Usually, when a story smells bad to a reporter, he or she has to do some digging to find out what’s wrong. It wasn’t all that difficult around here these past few days. An aroma that was so pungent some people were forced to stay inside or wonder about that fish they had in the refrigerator, blanketed an area from Plant City to Brandon and much of Tampa and Temple Terrace. Officials said the cause was a new pesticide called Paladin being used by strawberry farmers, which contains dimethyl disulfate, the source of the Big Stink. They also claimed the stuff is harmless to humans and smells a little like garlic. I know what a town that smells like garlic smells like. A number of years ago I was driving toward a political convention in California and got within about 10 miles of the town of Gilroy, the garlic capital of the world. Every year they have a garlic festival and you can smell the stuff for miles in every direction. I immediately made a detour for the town and tried the garlic ice cream ... not the best choice. Anyhow, what is permeating our town smells more like that odor from the red tide that used to regularly settle in along Bayshore Boulevard in South Tampa, sort of a combination of dead fish and rotten guavas. Apparently the farmers plan on continuing with Paladin every planting season, which means the “new normal’’ for that part of the county is going to be a little fishy. Steve Martin, was outside today, despite a strong odor in his Dover neighborhood. Martin says, " It smells like you have a gas leak." In some parts of his neighborhood, the smell was overpowering on Thursday, Martin worried about it Wednesday evening, "In fact we were going to call the gas company it was so strong last night that we were concerned. In fact, I went around and checked my own tanks." Tampa Fire Rescue says they started getting calls to 9-1-1 dispatch around 8:00 A.M. Thursday morning. Tampa Fire Chief Tom Forward said, "The first alarm came in at 8:06 this morning, because we were getting multiple calls from as far away east as 50-th street and I-4, to South Tampa and Howard and those areas, obviously we dispatched multiple units with sniffer units, co2 units and gas meters." After a day of investigation, Tampa Fire Rescue now says the smell is caused by a chemical known as Paladin. 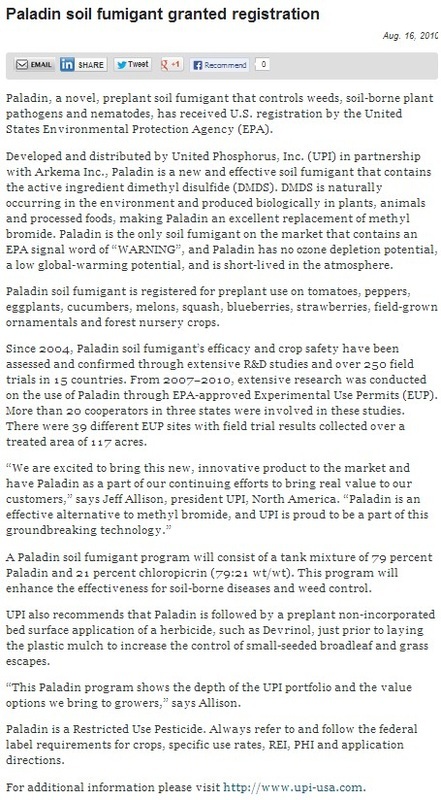 Paladin in a chemical fumigant that is used on strawberry farms. Tampa Fire Rescue said, "Environmental investigators have confirmed that the odorous smell was from a release of the chemical Paladin. This chemical pesticide was used in eastern Hillsborough County by strawberry growers. Product application is expected to be ongoing for another week. Detectable fumes and odors have diminished significantly, and residents in the City of Tampa have not been directly exposed or in any immediate danger." Steve Martin isn't happy about that, "Folks here that got COPD, bad health, the EPA suggested to our next door neighbor that they stay inside. Well, these are homes, we shouldn't have to stay inside." You can't breath the air or drink the water or eat decent food but then when did Hillbillies ever care about the quality of their lives. Take another hit of fresh Tampa Air! Keep away from heat, sparks and flames. Do not taste or swallow. Do not breath vapor or mist. Avoid contact with the skin, eyes and clothing. Wash thoroughly after handling. Ensure all containers are bonded and grounded during filling, transferring or emptying operations. Refillable container. 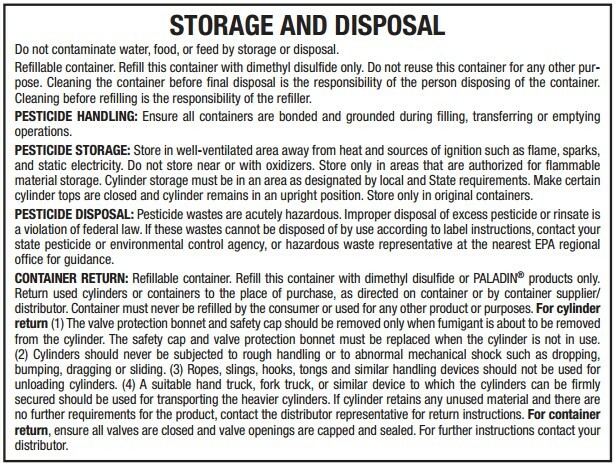 Refill this container with pesticide only. Do not reuse this container for any other purpose. Cleaning before refilling is the responsibility of the refiller. Cleaning the container before final disposal is the responsibility of the person disposing of the container. Container hazardous when empty. Emptied container retains product residue. RESIDUAL VAPORS MAY EXPLODE ON IGNITION. DO NOT CUT, DRILL, GRIND, OR WELD ON OR NEAR THIS CONTAINER. Improper disposal or reuse of this container may be dangerous and/or illegal. Moderate irritant. Contact with liquid or vapor may cause irritation. Practically non-toxic if absorbed following acute (single) exposure. May cause skin irritation with prolonged or repeated contact. Liquid may be absorbed through the skin in toxic amounts if large areas of skin are exposed repeatedly. The major health threat of ingestion occurs from the danger of aspiration (breathing) of liquid drops into the lungs, particularly from vomiting. Aspiration may result in chemical pneumonia (fluid in the lungs), severe lung damage, respiratory failure and even death. Ingestion may cause gastrointestinal disturbances, including irritation, nausea, vomiting and diarrhea, and central nervous system (brain) effects similar to alcohol intoxication. In severe cases, tremors, convulsions, loss of consciousness, coma, respiratory arrest, and death may occur. Excessive exposure may cause irritations to the nose, throat, lungs and respiratory tract. Central nervous system (brain) effects may include headache, dizziness, loss of balance and coordination, unconsciousness, coma, respiratory failure, and death. WARNING: the burning of any hydrocarbon as a fuel in an area without adequate ventilation may result in hazardous levels of combustion products, including carbon monoxide, and inadequate oxygen levels, which may cause unconsciousness, suffocation, and death. Contains benzene, a regulated human carcinogen. Benzene has the potential to cause anemia and other blood diseases, including leukemia, after repeated and prolonged exposure. Exposure to light hydrocarbons in the same boiling range as this product has been associated in animal studies with systemic toxicity. See also Section 11 - Toxicological Information. Irritation from skin exposure may aggravate existing open wounds, skin disorders, and dermatitis (rash). Chronic respiratory disease, liver or kidney dysfunction, or pre-existing central nervous system disorders may be aggravated by exposure. AND we buy and use gasoline in our cars every day. What's your point? Tampa, Florida -- The City of Tampa has addressed the strange smell around the area on Thursday morning. Tampa Fire Rescue and the Hillsborough County HealthDepartment have determined the unusual odor in the air is not a health risk. A pesticide called Paladin was sprayed in Eastern Hillsborough County is causing the odor. It contains Dimethyl Disulfide, which theEnvironmental Protection Agency says is a safe compound. Ted Campbell, who directs the Florida Strawberry Growers Association, told the Tampa Tribune it's the first year Paladin is being widely used by strawberry farmers. He says it's highly effective, but stinky. This is definitely not something I would want in my neigbourhood! unfortunately I live right across from one of the biggest strawberry farms around, and let me tell you this new pesticide really is stinky!! However: what really concerns me is the fact that it has obviously penetrated my well water because when you turn on the tap the spink will run you out of the house. there are "known" health hazards . known by the EPA, and the florida dept. of ag but in 2009, they chose to omit the reports of illness in the final experimental use report. TAMPA — It stunk - bad - in downtown Tampa on Thursday. Ditto for Brandon and Plant City and much of Tampa, from 50th Street and Interstate 4 to Hyde Park's South Howard Avenue, causing commuters to wrinkle and pinch their noses on their walks into office buildings. The good news: The noxious odor is from a new pesticide being used by strawberry farmers and is not a safety risk, according to agricultural officials. The bad news: The farmers aren't finished spraying and the winds aren't expected to change much, meaning the smell could be around awhile. The aroma was particularly noticeable early Thursday, sparking rumors of dangerous gas leaks and choking fumes from the Port of Tampa. Soon, though, authorities confirmed the noxious odor was from a pesticide being pumped into the soils of strawberry fields in eastern Hillsborough County. This is the first year most of the growers are widely using the pesticide Paladin, which contains dimethyl disulfate, said Ted Campbell, director of the Florida Strawberry Growers Association in Plant City. “It's actually very effective, but it really stinks,” Campbell said. With light morning breezes wafting in from the east, the fumes reminded urbane city-goers they are not that far removed from rural crop growers. The National Weather Service in Ruskin predicts winds over the next several days will come predominantly from the east and northeast, so the stench may be around for about a week. Soil fumigation must be finished three weeks before the strawberries are planted, which ideally is the first week in October. That means fumigation needs to be done by next week, Campbell said. For years, growers used methyl bromide, but the compound's effect on the ozone was called into question and the production of methyl bromide was discontinued by 2005. That left strawberry farmers looking for alternatives while they used up their last stockpiles of the stuff. This year, most have settled on Paladin, which is safer for the aquifer and dissipates in the soil quicker, Campbell said. The application basically sterilizes the soil, he said, killing off microscopic organisms, fungi and weeds that can be harmful to the tender young strawberry plants. Tampa Fire Rescue Chief Tom Forward said eight units responded Thursday to calls of gas smells around the city, including South Tampa. Firefighters used sniffing devices and found no harmful concentrations. For some with respiratory sensitivities, contact with the compound, which emerged on the market two years ago, can result in nausea, headaches, drowsiness or dizziness, the United Phosphorous website said. It is a restricted-use pesticide and can be applied only by certified handlers. No one was hospitalized or treated Thursday morning, Forward said. Forward said the substance meets all environmental restrictions and applications methods are stringent. Because the application are so controlled, the EPA has deemed dimethyl disulfide as safe. He said county emergency responders went out Wednesday morning on several calls around Brandon and other locations east of Tampa answering calls from residents complaining of the odor. No one was treated for respiratory illnesses related to the fumes, he said. * The EPA concluded that DMDS fumigant is not likely to get into food crops because the active ingredient is applied prior to planting and the level of DMDS breaks down by the time crops are planted. * An EPA assessment concluded that DMDS will not contaminate ground water or surface water. * DMDS has low toxicity when inhaled or when the skin is exposed to it. The primary health effect of DMDS is irritation of the nose and upper respiratory tract in shor-term exposures in some people. The EPA has concluded that people in areas near treated agricultural fields will not experience adverse health effects when DMDS products are used. * DMDS has a sulfurous odor similar to that of garlic and decaying fish, resembling the additive in propane gas, so the odor often is mistaken for a gas leak. The primary health effect of DMDS, dimethyl disulfide, is irritation of the nose and upper respiratory tract in short-term exposures in some people. Daughter, JM, is one of those people. She had a terrible time breathing yesterday & today. Guess she will have to stay inside until this mess passes. Chances are the person who applied the pesticide was an illegal immigrant who did not read - for whatever reason - the warnings or was just given a job to do and they did it. Spray the insecticide on berries - check. I didn't see any attempt by the glorious example of neo-journalism TBO to find out. I mean, that would take work. What farms are using it? Where are the farms? Why was it allowed to spread into the atmosphere? Who was doing the application? If it is being applied correctly (injected under plastic sheets) and dissipates quickly, why is the odor so strong that it can travel 25+ miles and be irritating? Someone is full of it. Strange, the label clearly states "if you can smell an objectionable oder similar to garlic, you should wear you air purifying device". Furthur on the label also states the odor may " cause dizziness, nausea, and headace"
Maybe I am misinterpreting the label. Are you kidding me? They are poisoning millions of people and they make like its safe. Go back to the bromide and tell the FEDS to go to hell. You can bet Mexico is using the cheaper stuff with no complaints. From the label of the manufacturer, stating if it can be smelled, a respirator must be worn. Who is paying Mother Trib to spout this crap? 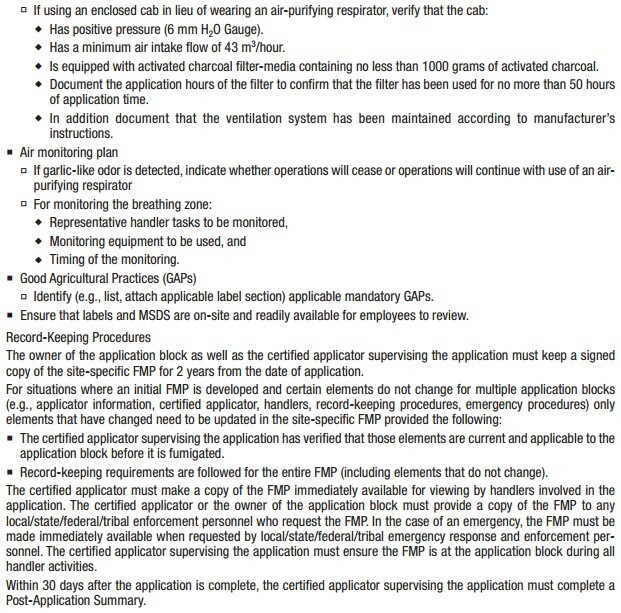 Arkema makes it, see what they say: Air monitoring and respiratory protection requirements for handlers. then a half face or full-face air-purifying respirator must be worn. how many parts per billion were over tampa? 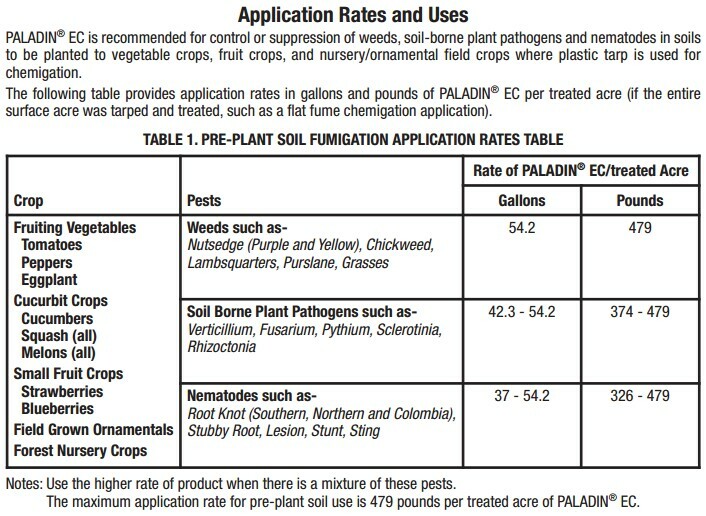 yes, it is hazardous in parts per billion from the msds http://www.kellysolutions.com/erenewals/documentsubmit/KellyData%5CMD%5Cpesticide%5CMSDS%5C55050%5C55050-4%5C55050-4_PALADIN_11_16_2011_9_21_29_AM.pdf. Refer to the label's section "Personal Protective Equipment for Applicators and Other Handlers" for handling liquid spills and leaks. Cease all operations if any leak develops in the fumigation system. Evacuate everyone from the immediate areas of the spill or leak. Approach the area from the upwind side. Work upwind to repair leak(s), if possible. Only correctly trained and PPE-equipped handlers are permitted to enter. Allow spilled fumigant to evaporate or to absorb onto vermiculite, dry sand, earth, or similar absorbent material. Such material should be disposed of on site or at an approved disposal facility. there is a reason berries are on the environmental working group's list of most contaminated produce. you'd have to really gullible to believe this is harmless. it kills microorganisms in the soil, yet is perfectly safe to breathe in? nausea and headaches, drowsy and dizzy--why worry? it's probably good for you. I agree--buy organic and stop the madness. Shelly Levine - VP of Operations at Watts, Dawson & Associates, Inc. I woke up at 4:30a.m. and couldn't breathe, my throat was closing and I had no idea why. I live in Temple Terrace. It wasn't until about 10:30 that I actually heard about the pesticide being sprayed. The smell was very strong in our Brandon office this morning and my eyes were irritated and burning all day. Odd coincidence I'd say. No more strawberries for me. I've been reading too much lately about how they're full of pesticides, and having been diagnosed to breast cancer, I'm trying to cut down on my pesticide intake, thank you very much. dimethyl disulfide is far from harmless - read the material safety data sheet. PHYSICAL HAZARDS: Flammable liquid and vapor. Vapor may cause flash fire. SHORT TERM EXPOSURE: potentially fatal if inhaled, irritation, cough, nausea, headache, drowsiness, dizziness, lung congestion. Come on Trib, get it together and proof your work. This kind of writing really downgrades your paper! From the photo caption... "The source of that gas-like smell in downtown Tampa? It was from a “harmless” from a pesticide that was sprayed on strawberry fields in eastern Hillsborough County." Vyonne Johnston - Administrative Assistant at Retired from Hillsborough County Public Works Dept. I live in Valrico and the odor tonight/this morning is almost unbearable! 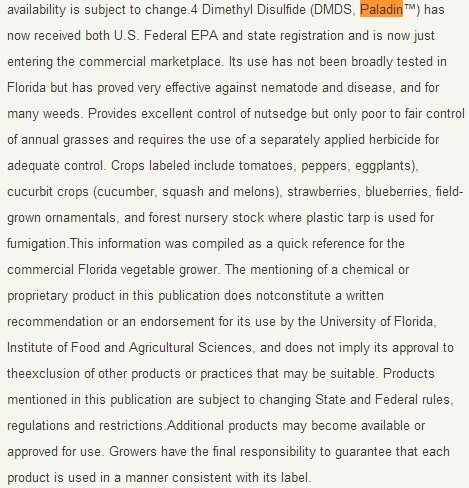 Published: Thursday, September 5, 2013 at 12:41 p.m.Last Modified: Thursday, September 5, 2013 at 12:41 p.m.
TAMPA — Officials are blaming a noxious odor that's settled over Tampa and the eastern portion of Hillsborough County on pesticides sprayed on strawberry fields. Tampa Fire Rescue and the Hillsborough County Health Department issued alerts Thursday morning, letting residents know that smell comes from a pesticide called Paladin. It contains dimethyl disulfide, which the Environmental Protection Agency has deemed safe. But that didn't stop people from holding their breath as they went about their business on Thursday. Ted Campbell, who directs the Florida Strawberry Growers Association, told the Tampa Tribune it's the first year Paladin is being widely used by strawberry farmers. "It's fumigation season," Campbell said. "We're using Padadin now. It's actually very effective, but it really stinks." For many years strawberry growers used methyl bromide. But the compound was discontinued in 2005 because of its possible effect on the ozone. The Tribune reports farmers used up their stockpiles while looking for a new compound. Paladin is safer for the aquifer and dissipates more quickly as the season continues. "It's getting wider usage this year," Campbell said. "So there is more stink this year." Growers must complete fumigation three weeks before the strawberries are planted, he said. The goal for planting is the first week in October. That means fumigation must be finished by next week. He says the process sterilizes the soil, killing off microscopic organisms, fungi and weeds that could be harmful to the strawberry plants. "It's not harmful to people," he said. "It's similar to the stuff they put in propane." TAMPA (FOX 13) -It was the million-dollar question on everybody's mind in Tampa after their morning commute: What in the world was that smell? "It had the smell of a natural gas, or a propane gas-type release," said Tampa Fire Rescue Chief Tom Forward. The "gas-like" smell was such an issue that emergency personnel in Tampa were forced into action. "911 dispatch center received an alarm of an odor in the downtown area," said Forward. An investigation turned up a few hunches, but no concrete answer. To get that, you had to head to strawberry country. The chemical has been used for a couple of weeks now. The smell found its way to Tampa thanks to a Florida summer tradition -- rain. "Last night was an atmospheric condition, when the rain moved in here last night, the cloud cover locks in your ground air, this particular gas is heavier than air so it moves to the lowest point geographically and I think it found Tampa," explained Campbell. "The pesticide that was used was paladin, which contains dimethyl disulfide, and is not toxic or poisonous." The mystery of smelly downtown Tampa solved, with the only victim being your sense of smell. "It's annoying. It's an inconvenience until we can get a breeze blowing it out of here," added Campbell. what else would the "officials" tell people. of course it is hazardous. the florida dept. 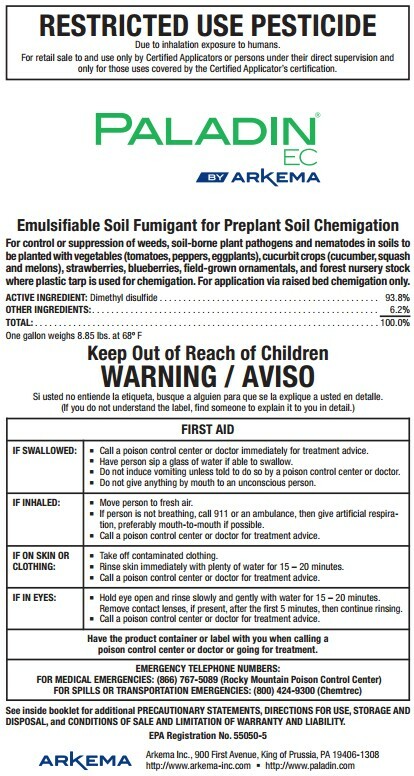 of agriculture knows all about this pesticide because during the experimental use of it in sept, 2009, they had a complaint about people getting sick and they relied on the epa's report that it was safe, totally disregarding the reported symptoms. 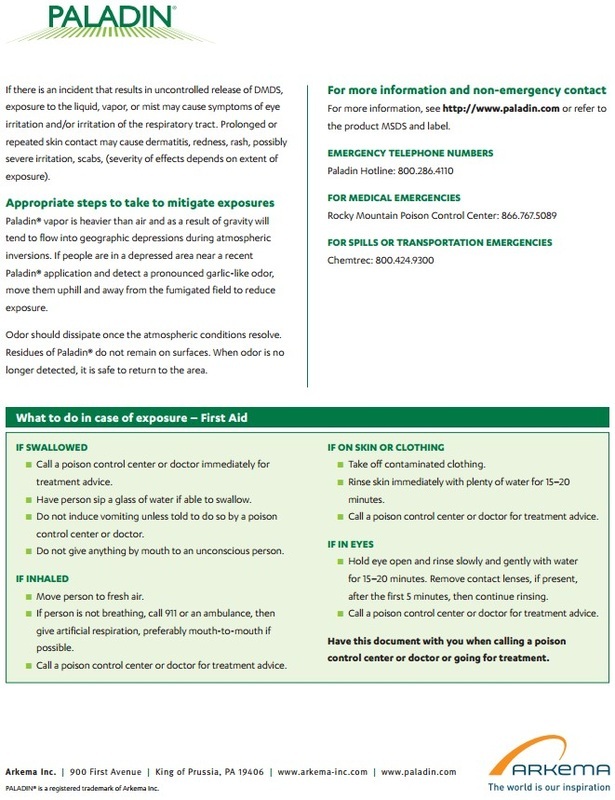 Fumigant Safe Handling Guide –. Paladin® EC (Dimethyl disulfide, DMDS). fumigants play a very important part in agriculture, but they also have the potential to pose risk concerns to people involved in the application, workers who reenter fumigated fields, and people who may be near the treated area. 2. Safe application and handling of Paladin® EC. The Paladin® EC Label contains important information about. requirements for safe use of the product, including: Specific symptoms of exposure. 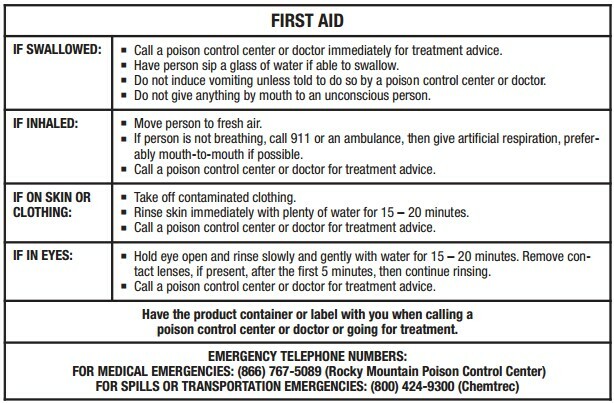 First aid in case of poisoning. Information for physicians The Label is the law. Comply with all label requirements. 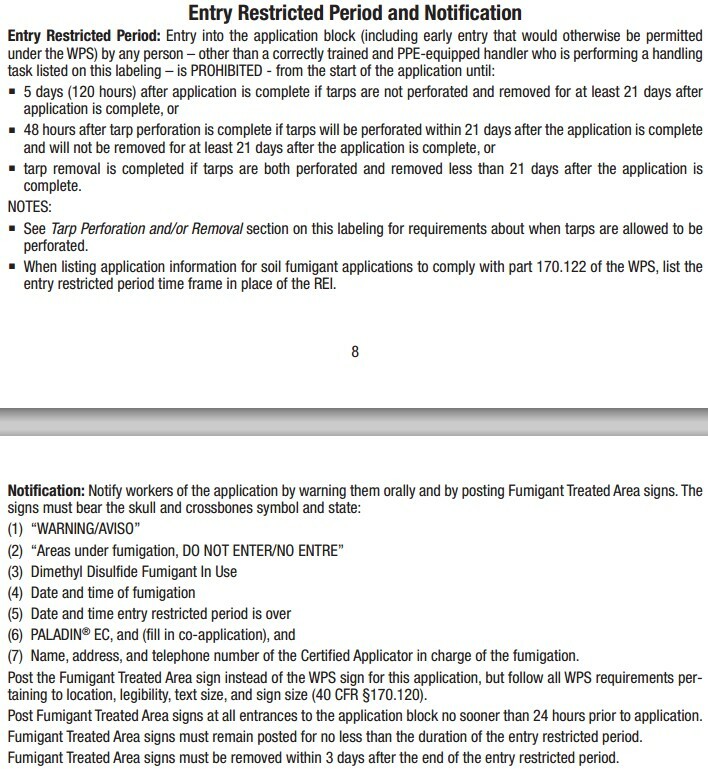 The Fumigant Management Plan also has important information. 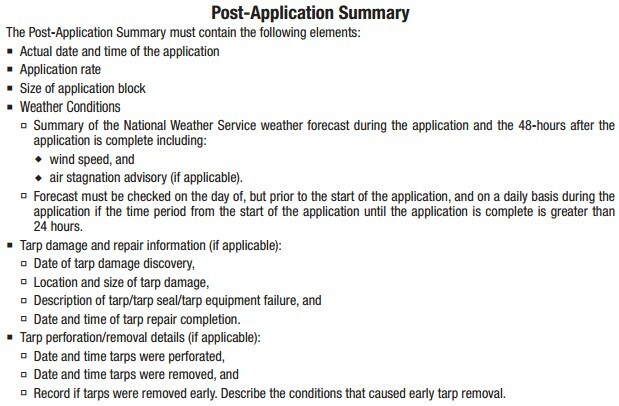 about safety and what to do in case of an emergency at the application site. You must have been trained as a pesticide handler before performing any handler tasks specified on the Paladin® EC Label. Make sure you have been trained in the proper use and operation of all fumigation equipment you will use before you begin work. Make sure you have been instructed in first aid and other. emergency procedures. Immediatelyreport all accidents, illnesses, or signs of exposure to the employer, supervisor or Certified Applicator. alibration or adjustment. Equipment clean-up Repair of Paladin® EC-containing equipment. Product sampling Any activity within 6 feet of an unshielded pressurized hose containing Paladin® EC. Spill clean-up Rinsate disposal Handler sper forming tasks with liquid contact potential must wear: Loose fitting or well ventilated long-sleeved shirt and long pants. Chemical-resistant gloves Chemical-resistant footwear Socks Full-face shield or safety glasses with brow, temple and side protection. DO NOT wear goggles. Handlers must follow all respiratory protection requirements in Label. 3. 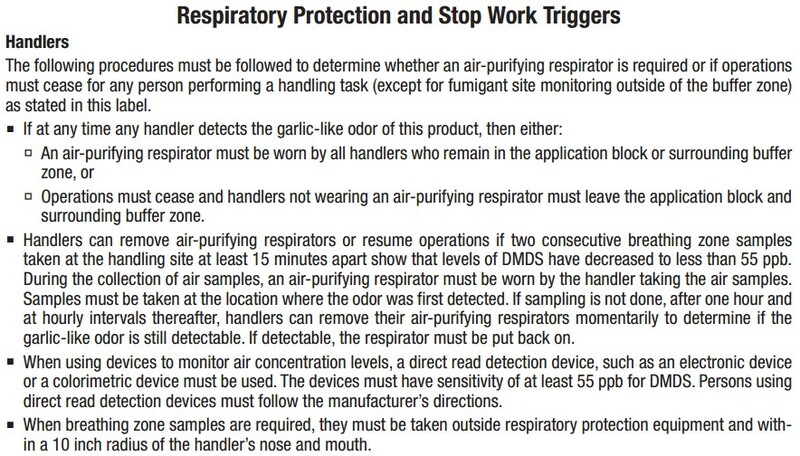 Air monitoring and respiratory protection requirements for handlers. The strong odor of DMDS can be detected at levels below the levels leading to nasal irritation and other symptoms. If any handler within an application block detects the garlic-like odor of this product, then a half face or full-face air-purifying respirator must be worn. Any handlers not wearing respirators must cease. Anything that smells like that can't be good, I think I'll go jog in New Tampa until they are finished saturating the soil with whatever it is... I wonder if its made by Monsanto? Doesn't sound dangerous at all. NOT! That would have to be an incredible amount od pesticide to cover the whole city in that smell. Something smells fishy here. You're not alone if you smelled an unpleasant odor in Tampa and beyond Thursday morning. Here's what's been reported, and some community reactions. The stink you've been smelling in Eastern Hillsborough County? No, the unusual smell was not from a gas leak, but from a pesticide sprayed that officials say have no known health hazards, according to a news alert issued by police and health officials today, Thursday, Sept. 5. But that's where the conversation on Facebook begins, not ends, as people are raising a stink about what one person called, "the oddest smell." According to a TBO.com report, the "stinky aroma" that "settled on streets in and around downtown Tampa" could be traced to "a pesticide spray that was sprayed on strawberry fields in eastern Hillsborough County." 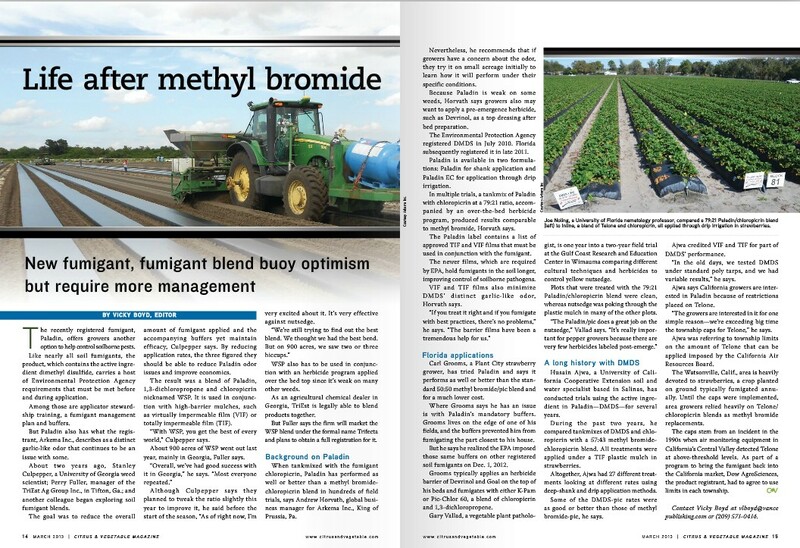 Ted Campbell, director of the Florida Strawberry Growers Association in Plant City, is quoted in the Tribune report as saying: "It's fumigation season. We're using Paladin now. It's actually very effective, but it really stinks." Reportedly, Paladin "is safer for the aquifer and dissipates more quickly as the season wears on." For more, read Odor In Downtown Tampa Blamed On Pesticide, by Tribune staff reporter Keith Morelli, posted at TBO.com, Sept. 5. "Tampa Fire Rescue and the Hillsborough County Health Department have determined the unusual odor in the air this morning in Tampa is NOT a health risk. A pesticide that was sprayed in Eastern Hillsborough County is causing the odor. The pesticide is called Paladin and contains Dimethyl Disulfide. Other than the unpleasant odor, there are no known health hazards." Hillsborough County Fire Rescue is one of the many agencies involved in the on-going investigation of strong sulfur type odors from the east part of the County. We have received updated reports from the Department of Agriculture and Consumer Services and Environmental Protection Commission of Hillsborough County. Please see the FAQ on Dimethyl Disulfide that the FDACS provided. We will continue to coordinate closely with FDACS and the other agencies involved." "Environmental investigators have confirmed that the odorous smell was from a release of the chemical Paladin. This chemical pesticide was used in eastern Hillsborough County by strawberry growers. Product application is expected to be ongoing for another week. Detectable fumes and odors have diminished significantly, and residents in the City of Tampa have not been directlyexposed or in any immediate danger." Assurances aside, that "there are no known health hazards," is not comforting news to many, according to Facebook chatter today. " "No known' is they key phrase," wrote one poster, about his concerns. "What type of pesticide and exactly where?" wrote another. "It smelled funny in the Riverview/Apollo area." In her Facebook post, Kerri McDougald said to "thank your local strawberry growers, who use pesticides away above the norm." She claimed to have called the strawberry growers association, and that she was told the pesticide was approved by the FDA. But nevertheless, McDougald wrote: "Dimethyl sulfide is highly flammable and [an] irritant to eyes and skin. It is harmful if swallowed and has an unpleasant odor at even extremely low concentrations. Its ignition temperature is 205 °C. Why would we want [to] eat something that is harmful if swallowed on our strawberries?" "The odor of DMDS has been described in the literature as pungent garlic, propane, decaying fish, or decomposing materials. A literature review conducted by the registrant suggests that the mean odor threshold for DMDS is 7 to 12 ppb (0.007 - 0.012 ppm), which is approximately three orders of magnitude below the concentration at which nasal irritation is observed in rodent inhalation studies. This suggests that individuals near a treated field are likely to detect the odor of DMDS before it reaches a concentration at which it would begin to produce nasal irritation. However, the time required for a person to detect the odor and the variability and aversion to the odor among various individuals is not currently known for DMDS." My child & three other children left school downtown from nausea & headaches. I made that comment on the TBO article. That was only one of several comments about how the pesticide doesn't seem harmless. The article was taken down, rewritten with more positive information, & all the comments deleted. That comes across as suspicious to me. I won't be buying strawberries, from Florida, this coming season. So interesting that I just happened to wake up with my eye swelled shut and my face I've felt like scratching off . I walked outside and thought my husband had sprayed round up all over . I've lived here since I was 3 & have never encountered this ! I'm a little sick and tired of all these problems strawberry farmers cause...sink holes, poisons in their "fumigation"...over it. At the very least, the farmers should have provided advanced notice to the local authorities that this spraying would possibly affect the local area's air quality (smell). While agriculture is a very important part of our economy in Hillsborough County, some of the farmers need to take environmental responsibility more seriously. Can form explosive mixtures in air. Can cause irritation to eyes and skin. possible dermatitis. Eye contact may be irritating. Potential chronic health effects CARCINOGENIC EFFECTS: Classified A4 (Not classifiable for humans or animals.) by ACGIH [carbon disulphide]. Medical conditions aggravated by over- exposure Acute or chronic respiratory conditions may be aggravated by overexposure to this gas. Other hazards which do not result in classification - Stench. Hazard statement(s) - H225 Highly flammable liquid and vapour. - H302 Harmful if swallowed. - H313 May be harmful in contact with skin. - H316 Causes mild skin irritation. - H319 Causes serious eye irritation. - H331 Toxic if inhaled. - H335 May cause respiratory irritation. - H411 Toxic to aquatic life with long lasting effects. Precautionary statement(s) - P210 Keep away from heat/sparks/open flames/hot surfaces. - No smoking. - P261 Avoid breathing dust/ fume/ gas/ mist/ vapours/ spray. 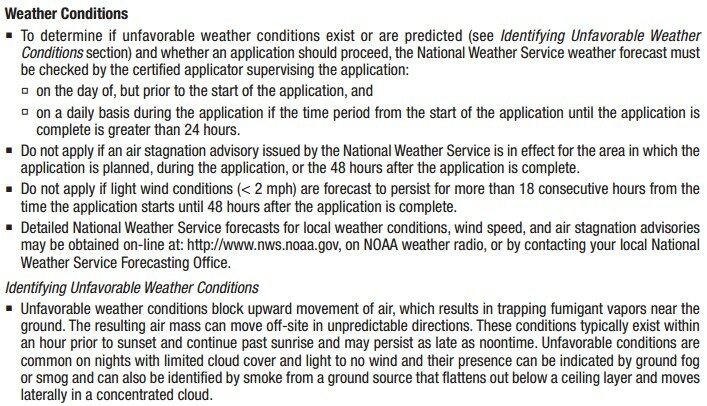 - P273 Avoid release to the environment. - P305 + P351 + P338 IF IN EYES: Rinse cautiously with water for several minutes. Remove contact lenses, if - present and easy to do. Continue rinsing. - P311 Call a POISON CENTER or doctor/ physician. Potential Health Effects - Inhalation Toxic if inhaled. Causes respiratory tract irritation. - Skin May be harmful if absorbed through skin. Causes skin irritation. - Eyes Causes eye irritation. - Ingestion Toxic if swallowed. FIRST AID MEASURES - General advice - Consult a physician. 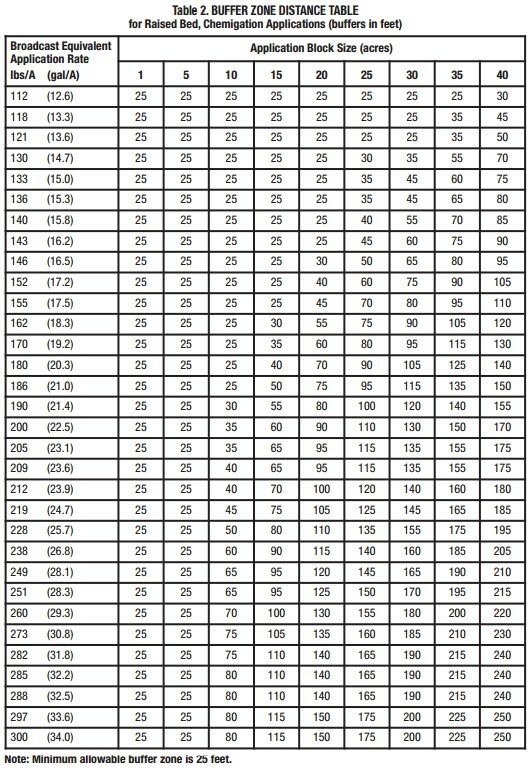 Show this safety data sheet to the doctor in attendance. Move out of dangerous area. HANDLING AND STORAGE - Precautions for safe handling Avoid contact with skin and eyes. Avoid inhalation of vapour or mist. Use explosion-proof equipment. Keep away from sources of ignition - No smoking. Take measures to prevent the build up of electrostatic charge. - Conditions for safe storage Keep container tightly closed in a dry and well-ventilated place. Containers which are opened must be carefully resealed and kept upright to prevent leakage. Personal protective equipment - Respiratory protection use full-face respirator - Hand protection Handle with gloves. Gloves must be inspected prior to use. Dispose of contaminated gloves after use in accordance with applicable laws and good laboratory practices Material: Fluorinated rubber Minimum layer thickness: 0.7 mm - Skin and body protection Complete suit protecting against chemicals, Flame retardant antistatic protective clothing, The type of protective equipment must be selected according to the concentration and amount of the dangerous substance at the specific workplace. Conditions to avoid Heat, flames and sparks. Extremes of temperature and direct sunlight. Carcinogenicity IARC: No component of this product present at levels greater than or equal to 0.1% is identified as probable, possible or confirmed human carcinogen by IARC. Carcinogenicity ACGIH: No component of this product present at levels greater than or equal to 0.1% is identified as a carcinogen or potential carcinogen by ACGIH. Carcinogenicity NTP: No component of this product present at levels greater than or equal to 0.1% is identified as a known or anticipated carcinogen by NTP. Carcinogenicity OSHA: No component of this product present at levels greater than or equal to 0.1% is identified as a carcinogen or potential carcinogen by OSHA. Specific target organ toxicity - single exposure (Globally Harmonized System) Inhalation - May cause respiratory irritation. Potential health effects Inhalation Toxic if inhaled. Causes respiratory tract irritation. Ingestion Toxic if swallowed. Skin May be harmful if absorbed through skin. Causes skin irritation. Eyes Causes eye irritation. Other adverse effects An environmental hazard cannot be excluded in the event of unprofessional handling or disposal. Toxic to aquatic life with long lasting effects. 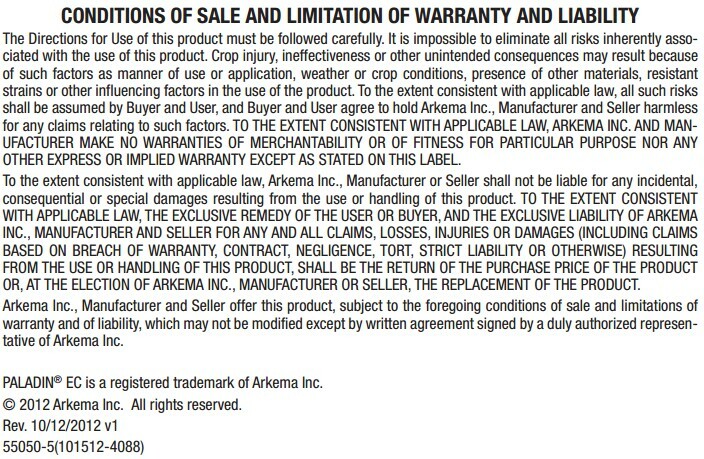 Sigma-Aldrich Corporation and its Affiliates shall not be held liable for any damage resulting from handling or from contact with the above product. 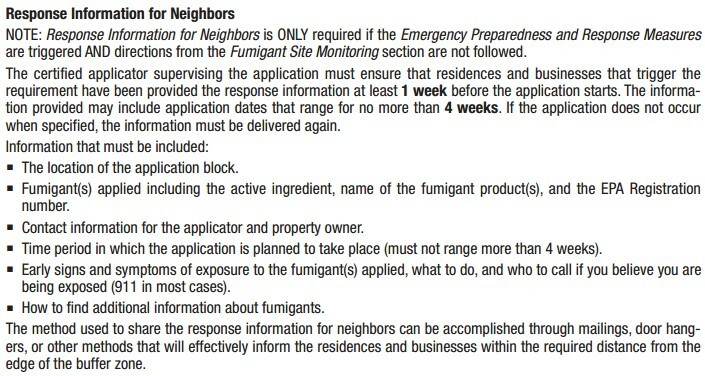 Prior to the start of fumigation, the Certified Applicator supervising the application must verify that a site-specific FMP exists for each application block. 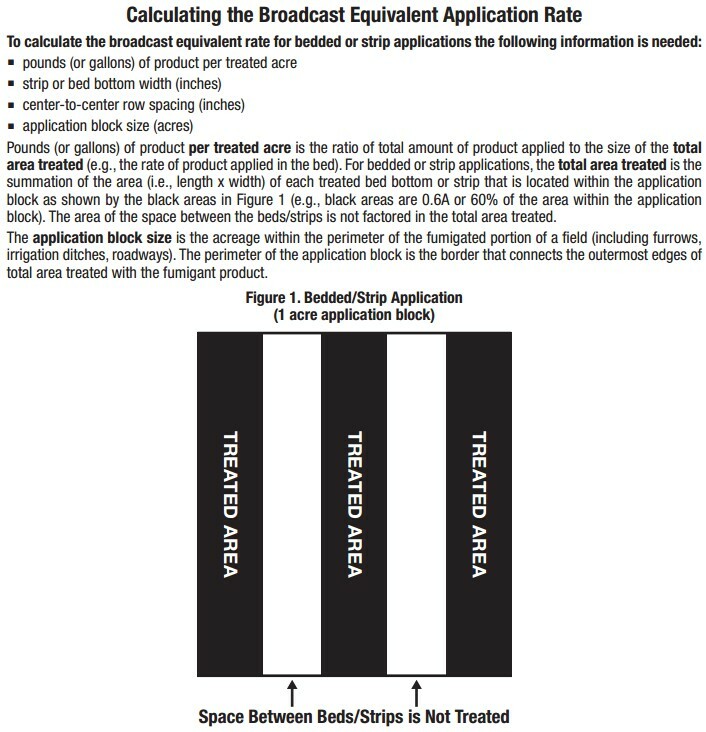 dimethyl disulfide (Paladin), in combination with chloropicrin and metam sodium or potassium is also expected to provide a basis for statewide grower trialing of yet another effective alternative chemical approach to replace methyl bromide. EPA will only recognize use of specific high barrier or true VIF mulch films where film permeabilities (mass transfer coefficients) to the different fumigant gases have been measured and meet EPA approved emission reductions to qualify for buffer zone reducing credits. the more impermeable plastic SIF or VIF mulches, fumigant rates can be reduced 25% to 40% from maximum labeled application rates. 1. What is dimethyl disulfide? Dimethyl disulfide (DMDS) is a recently registered soil fumigant approved for pre-plant use on agricultural fields. In addition, DMDS can occur naturally in soil, wetlands, oceans and outdoor air, and plays a role in the global sulfur cycle. DMDS is also naturally produced by some plants, including certain food crops, and can be present in certain dairy products. In the United States and Europe, DMDS is an approved food additive used for flavoring. 2. What DMDS products are registered in Florida? 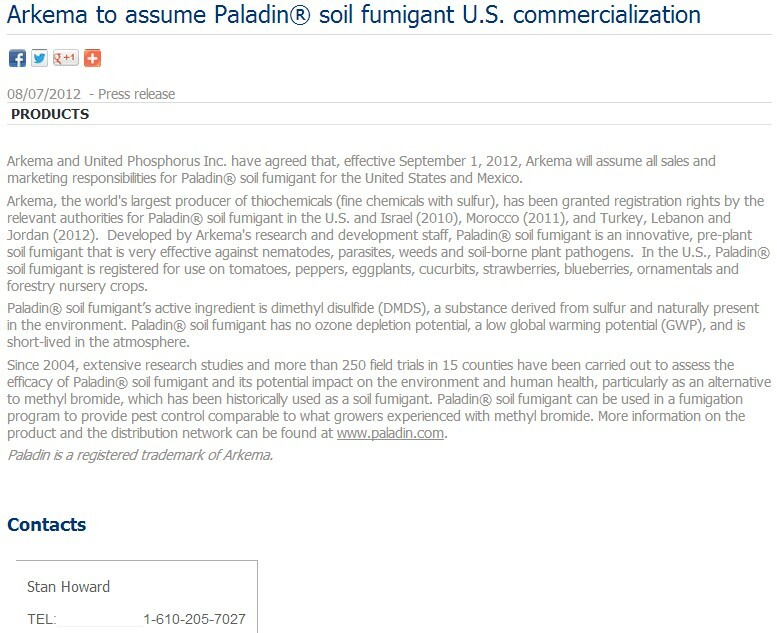 In May 2011, the Florida Department of Agriculture and Consumer Services (FDACS) granted Arkema, Inc. conditional registration of technical DMDS and two fumigation products: Paladin(R) (98.8% DMDS) and Paladin(R) EC (93.8% DMDS). Both of these products are registered to control pre-emergent weeds, soil-borne plant pathogens, and nematodes in soils used to grow vegetables, cucurbits, strawberries, blueberries, field-grown ornamentals and forest nursery stock. These formulations may be used alone or in combination with chloropicrin, another fumigant, for greater overall effectiveness. 3. 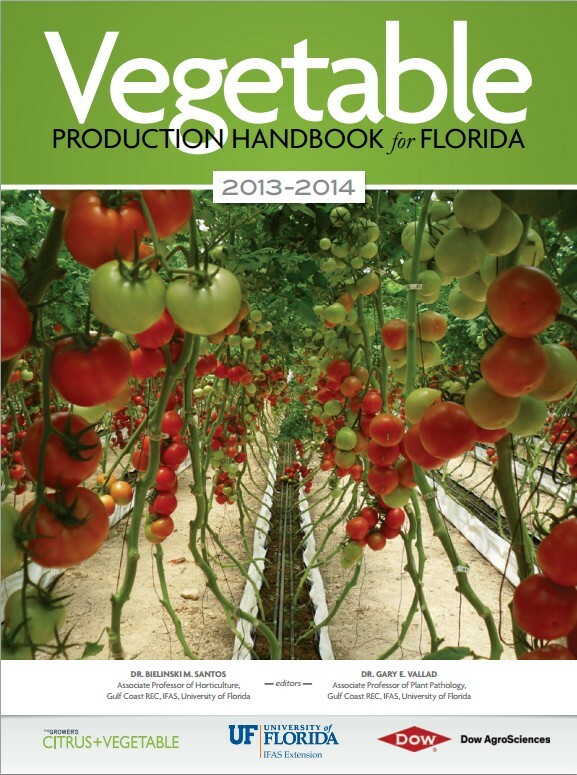 Why is DMDS needed for Florida agriculture? 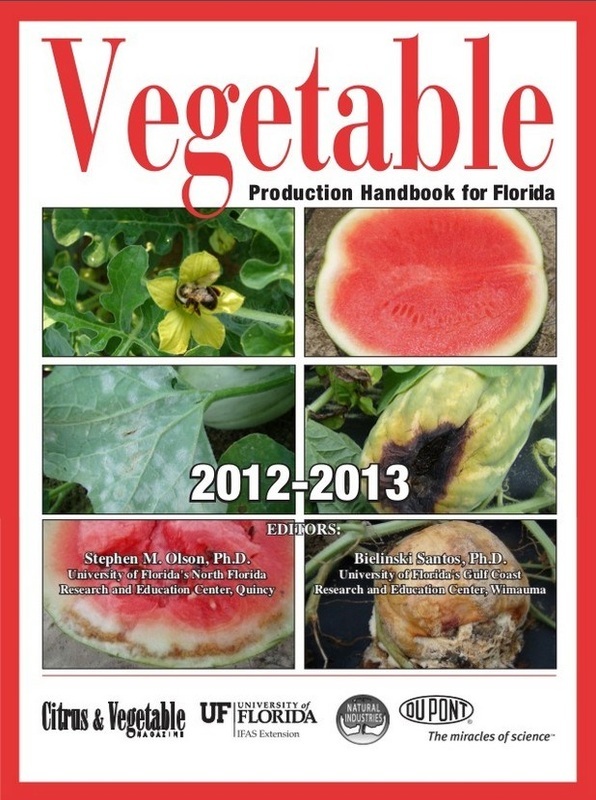 Broad-spectrum agricultural fumigants, like DMDS, are needed in Florida because of the high pest pressure here, where non-chemical alternatives are not always possible or practical for all crops. With the gradual phase out of the highly effective fumigant, methyl bromide, there is growing need for alternative fumigants. DMDS has been marketed as one of those alternatives. 4. Where, when and how is DMDS applied? Prior to planting, DMDS is either injected beneath the soil surface with specialized application equipment or it is applied to the soil surface through a drip irrigation line. Once the DMDS has been applied, the treated area is immediately covered with a plastic tarp to help retain the fumigant in the soil and improve efficacy. 6. Is DMDS likely to get into ground or surface water? A qualitative EPA assessment concluded that DMDS will not contaminate ground water or surface water. FDACS conducted computer simulations assuming reasonable worst-case Florida environmental conditions and confirmed that DMDS is unlikely to adversely affect the quality of ground water or surface water. FDACS also evaluated the fate of methanesulfonic acid (MSA), the major degradate of DMDS. MSA is produced naturally in the environment as part of the sulfur cycle and generally exhibits low to moderate toxicity. However, it can be mobile in soil and relatively persistent compared to DMDS. Although more mobile, MSA also poses minimal risks to water quality. 7. How can DMDS affect human health? Most agricultural fumigants, including DMDS products, generally are of low to moderate toxicity. However, because they are used to control a wide range of pests, large quantities are applied to agricultural fields, making them potentially hazardous. By most measures, the toxicity of DMDS is similar to or less than that of methyl bromide and other agricultural fumigants. DMDS has low toxicity when inhaled or when the skin is exposed to it. The primary health effect of DMDS is irritation of the nose and upper respiratory tract. The EPA concluded that a concentration of DMDS in air of 55 parts per billion (ppb) or less is not expected to cause irritation or other health effects. DMDS is moderately irritating to the eyes and is minimally irritating to skin with normal low concentration, short-term exposure. DMDS has not been shown to cause allergic sensitization, birth defects, reproductive toxicity or mutagenicity. The EPA concluded that people in areas near treated agricultural fields will not experience adverse health effects when DMDS products are used according to the stringent requirements of their product labels. Workers are required to wear personal protective equipment to prevent harmful exposures. 8. What about the odor of DMDS? DMDS has a sulfurous odor similar to that of garlic and decaying fish. 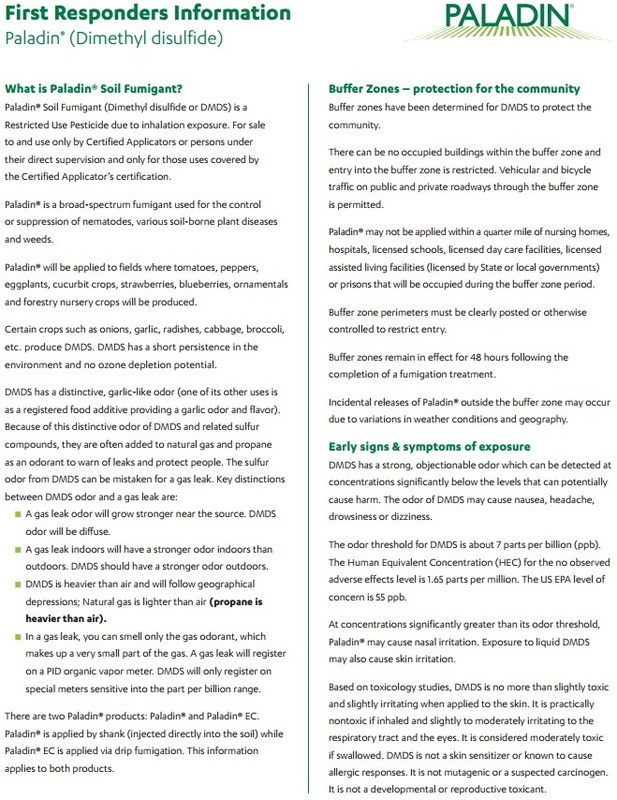 Because of the distinctive odor of sulfur compounds, similar to DMDS, they are often added to natural gas and propane to warn of leaks and protect people. Therefore, the odor of a DMDS fumigation can be mistaken for a gas leak. 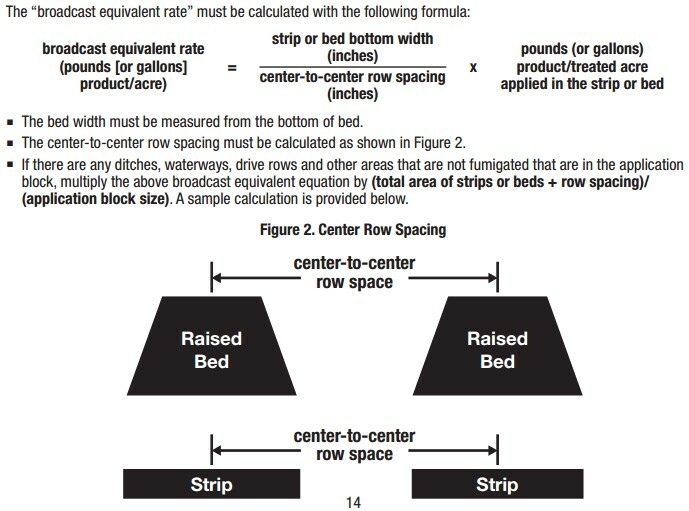 DMDS has an odor threshold of approximately 7 ppb, which is about 8 times less than the health-based level considered by the EPA to be safe (55 ppb). Since the odor threshold for DMDS is much lower than levels potentially affecting human health, under certain environmental conditions, unpleasant odors may occur in and around use areas for short periods of time, despite buffer zones to protect bystanders from adverse health effects. In sensitive people, the odor of DMDS may result in nausea, headache, drowsiness or dizziness. 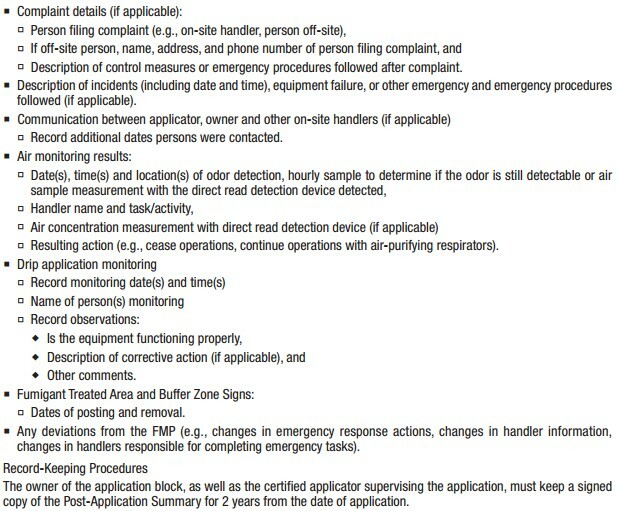 FDACS required the registrant to provide air modeling to predict the distance from application that DMDS odor might be detected in order to better characterize whether or not DMDS is the source of a nuisance odor complaint. NOTE: FDACS also required the registrant to advise emergency responders prior to product use and to promptly respond to and report any odor complaints. monitoring show that dimethyl disulfide should not reach levels that would harm wildlife or aquatic organisms. 10. What has the EPA done to ensure the safe use of DMDS in the U.S.? The EPA has taken steps to ensure the compliant and safe use of DMDS. First, EPA requires and reviews numerous scientific studies for registration. These studies quantify the potential toxicity to people and animals and characterize DMDS' environmental fate in soil, water, and air. Taken together, the EPA can then predict exposures and mitigate unacceptable risks. Second, like all other fumigants, DMDS is a restricted use pesticide that can only be used under the direct supervision of certified applicators that have undergone extensive training on requirements that apply prior to, during, and following soil treatment. Third, the EPA has required several new safety requirements for DMDS and other agricultural fumigants. One new requirement is the inclusion of a "buffer zone" surrounding the field in which bystanders and unprotected workers cannot enter for 48 hours after the end of the application. 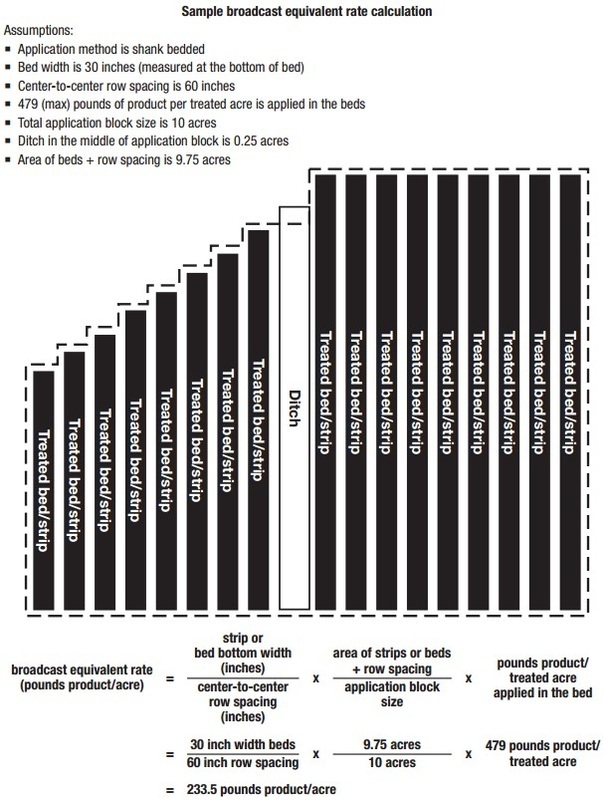 The size of the buffer zone depends on the area being fumigated, the amount of DMDS being applied per acre and other factors. 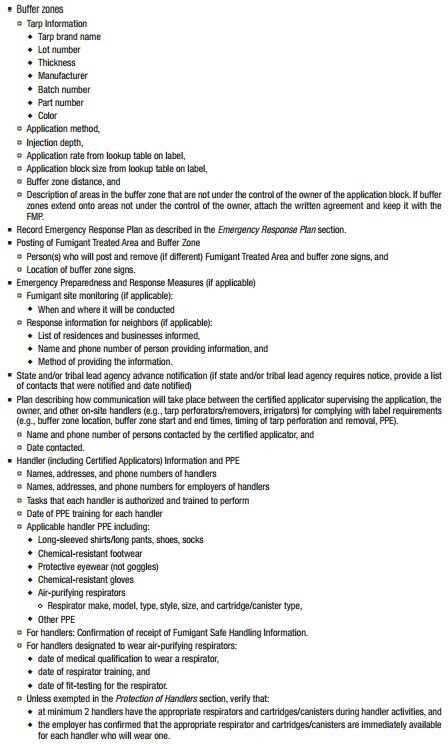 Fourth, the Paladin(R) products cannot be applied within a quarter mile of nursing homes, hospitals, licensed schools, licensed day care facilities, licensed assisted living facilities (licensed by State or local governments) or prisons that will be occupied during the buffer zone period. 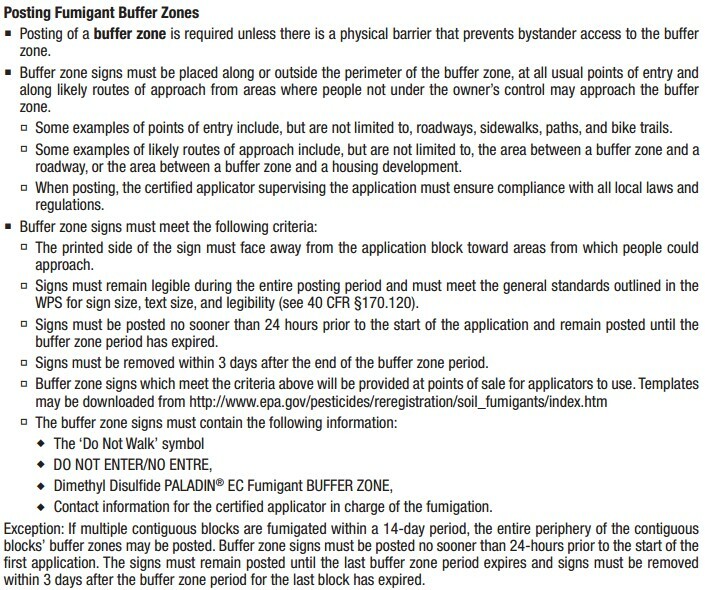 Buffer zone perimeters must be clearly posted or otherwise controlled to restrict entry. 11. What has the Florida Department of Agriculture and Consumer Services done to ensure the safe use of DMDS in Florida? Over a period of eight months, FDACS conducted a comprehensive, new active ingredient review examining a wide array of studies provided by the registrant and from the open scientific literature. The Department also reviewed the EPA's risk assessment and risk mitigation measures for DMDS. FDACS engaged in numerous discussions on DMDS with a number of diverse groups, including the DMDS registrant, the EPA, the Florida Department of Health, the Florida Department of Environmental Protection, the Florida Fish and Wildlife Conservation Commission, Florida growers, the University of Florida, and Florida farm worker advocates. Florida's review process resulted in various conditions being required of the registration. Of particular interest was a requirement that the registrant carry out a robust product stewardship program in Florida to assist applicators in the proper use of the product. Also, as a condition of registration, the registrant committed to audit at least 10 applications to make sure their training is working and their product is being properly applied. If you have additional questions, please contact the Bureau of Pesticides at (850) 617-7917. 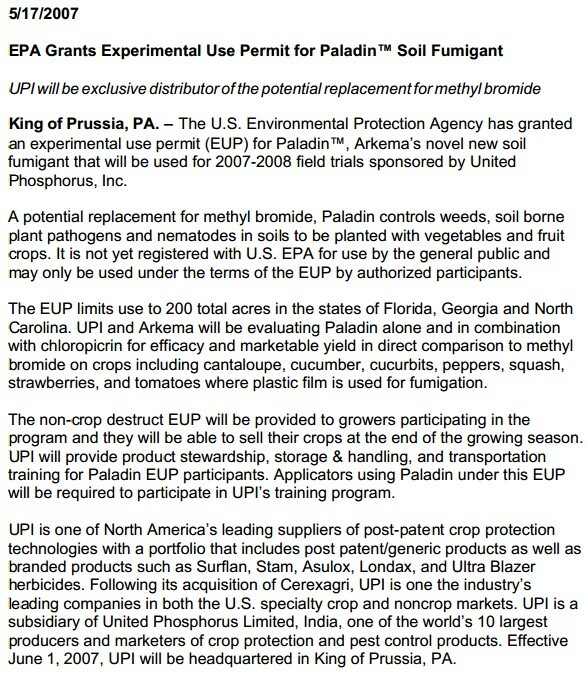 UPI is one of North America’s leading suppliers of post-patent crop protection technologies with a portfolio that includes post patent/generic products as well as branded products such as Devrinol®, Assail®, TopsinM®, Surflan® herbicide, Penncozeb®, Microthiol® Disperss® and Ziram® fungicides, and Cuprofix® Ultra 40 Disperss® bactericide. 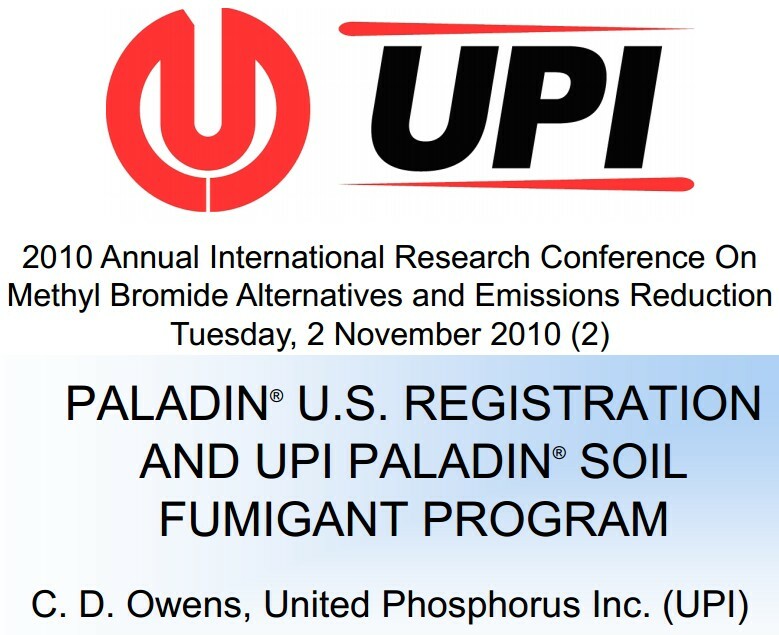 UPI’s North American headquarters are in King of Prussia, PA. PALADIN® is a registered trademark of Arkema Inc.
Industrially, DMDS is used in oil refineries as a sulfiding agent. DMDS is also an effective soil fumigant in agriculture, registered in many states in the U.S. as well as globally. DMDS is an important alternative in replacing methyl bromide, which is being phased out. 4. Hematological health effects of organic sulfide exposure on employees at a pulp and paper plant have been studied, but the role of dimethyl disulfide in these effects is unknown. 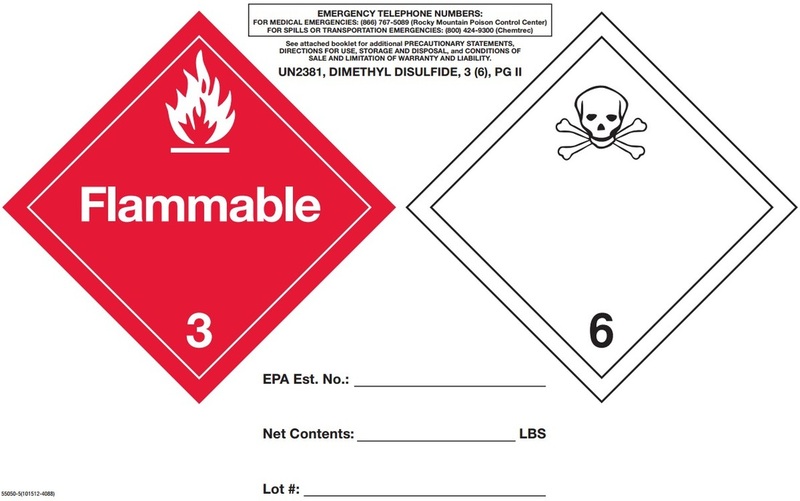 International Chemical Safety Cards (WHO/IPCS/ILO): Dimethyldisulfide. "Dimethyl sulfide is a water-insoluble flammable liquid that boils at 37 °C (99 °F)"
" It is also an indication of bacterialinfection in malt production and brewing." "It is a breakdown product of dimethylsulfoniopropionate (DMSP), and is also produced by the bacterial metabolism of methanethiol." "The largest single commercial producer of DMS in the world is Gaylord Chemical Corporation, which until mid-2010 was a significant economic component of the paper industry of Bogalusa, Louisiana." "The Bogalusa DMS plant operated continuously until this date, since its startup in 1961 by the now defunct Crown Zellerbach Corporation." "Gaylord has no production of any kind at the old Louisiana site after opening its expanded DMS / Dimethyl sulfoxide operation in Tuscaloosa, Alabama in 2010." "ChevronPhillips Chemical Company is another major manufacturer of DMS. CP Chem produces this material at their facilities in Borger, Texas, USA and Tesserndelo, Belgium." "Dimethyl sulfide is highly flammable and irritant to eyes and skin. It is harmful if swallowed and has an unpleasant odor at even extremely low concentrations. Its ignition temperature is 205 °C." Dimethyl Sulfide Overview by Gaylord Chemical Company, L.L.C.